Graphic designers and other creatives with a strong aesthetic sense often lack the gene responsible for coding, and vice versa. For this reason, designers have to cooperate with developers to have their designs manually converted into valid code. ‘If only there was a program allowing to design websites in a code-free manner’, – many designers wondered. Tada! Meet Adobe Muse. This program was exclusively developed for designers who want to create functional artworks without fiddling with codes/hiring a developer. The very fact that this piece of software has the Adobe name attached to it, deserves your attention. So let’s take a short journey into Adobe Muse’ main features, advantages and possible disappointments. Because this website builder was developed with the needs of professional designers in mind, it may seem fairly complicated for non-designers. Unlike Do-It-Yourself website builders, it does require prior experience of graphic design. Take a look at the editor – there are 5 toolbars each hiding more options! All in all, Muse looks, performs and feels just like any other Adobe product. So, if you happened to work in InDesign, Illustrator or Photoshop, the interface won’t scare you away. Adobe Muse employs the drag-and-drop editing principle which also simplifies the creation process. Because Adobe Muse is primarily meant for graphic designers, it provides an impressive design toolkit. This is the key difference between Muse and DIY site builders. Those using site builders like Wix and Weebly have to upload ready elements, while those using Adobe Muse can draw them directly in the program. Building a website with Muse starts with defining your site map. When it’s ready, you can start designing your Master page. This page will hold parts of the design that you’ll use on every page of the website. This is a very clever solution to a common problem. Once you have designed your pages, you can start adding widgets. There’s a list of free widgets that you can find in the editor, and an impressive library of third-party extensions. Widgets are configurable and styleable components that you can adjust to match your site style. While the demand for responsive design keeps growing with every passing year, Adobe Muse doesn’t stop on its current achievements as well. The system developers have recently introduced responsive widgets, which allow creating flexible website design with no hassle at all. From now on, it has become possible to make any default Adobe Muse composition widget responsive prior to placing it on a page. This means that all the content available in the Form, Slideshow and Composition widgets has become responsive and automatically adjusts to any screen sizes and resolutions. This contributes to better website performance and excellent web design presentation. Another advanced Adobe Muse feature, which has recently been introduced, is Copy and Paste Attributes. The option is used to speed up and simplify the web design process by copying the attributes and pasting them from one website object to another. This concerns the most popular attributes, including opacity, font, stroke, fill color etc. Text synchronizing. If you use the same copy throughout your website, you no longer need to edit each place where it’s used. With this feature, all your edits will automatically synchronize across your site. Additionally, you can take advantage of the Find and replace feature to search for words and then replace them across all pages including the mobile version. Thousands of premium web fonts from Typekit and self-hosted web fonts. Users can add fonts they’ve purchased elsewhere to the Adobe Muse fonts menu. Also, they can add fonts from Typekit directly through Adobe Muse – no worrying about embed codes or licensing. Browse quickly by family, classification, and more. You can then use these fonts even when you’re offline. Right-to-left language support. Users can create text containers, specific pages, and entire sites using right-to-left languages such as Hebrew and Arabic. Blogs, storefronts and more. New Adobe Muse third-party widgets let you add an online store, integrate and style a blog from literally any blog service like WordPress or Tumblr, add photo album carousels, and more. Adobe Muse has no ready-to-use templates – Muse gives you a blank canvas, which means you’ll have to design headers, navigations, buttons, footers and more from scratch. While that’s okay for designers, it can be a burden for other users. The good news is that there are many designers who create and sell templates tailored specially for Adobe Muse. Adobe Muse features best templates providers on the Resources page. Some of the highly-trusted resources for Muse designers are Muse-Themes, MuseFree, Musegain, and museGrid among other approved providers, some bringing entirely free design resources including graphics, time saving starter templates, and other library files. But you should always be aware from purchasing or downloading themes from unknown resources, as they may contain a specific code that may cause damage to your website in future. There’s a Customer Care Page, forums and an impressive knowledge base at Adobe. There are video and written tutorials detailing each single step of building sites with Adobe Muse. Additionally, there’s an entire ecosystem of third-party highly creative tutorials to help you dive deeper into advanced design techniques. Adobe Muse is available through a Creative Cloud single-app or complete membership with the option to choose between a month-to-month ($24.99/mo) or annual plan ($14.99/mo). If you are not an Adobe Creative Cloud user, you can download Adobe Muse free of charge and use it during a 7-day trial. It’s important to note that not all Adobe Muse widgets are free. For instance, if you want to add a blog feed to your site, there are both free and paid widgets. For instance, the Medium Blog Feed widget is free, but Flickr Slide or WP Blog Embed are paid (both cost $6). Once you are ready to take your site live, you have a choice — you can either host your site using a third-party hosting provider or host with Adobe. Smooth Web Design Process. Adobe Muse was created with the needs of web designers in mind. This concerns both the professionals and newbies, who, however, may consider the system a bit complicated. What’s interesting, the dashboard of the system resembles that of Photoshop. As a result, those users, who have ever worked with Photoshop and other Adobe products, will easily get used to Adobe Muse, even if they are non-techies. The service comes with a convenient WYSIWYG editor and there is no need to use coding skills here. At the same time, experienced web designers can practice their HTML and CSS skills to create awesome websites from scratch. Impressive Design Toolkit. The website builder has an impressive and stunningly powerful toolkit, which provides a broad array of website design options. They make it possible to give your project personalized look by changing the backgrounds, adding scrolling effects, setting shapes, colours, icons etc. The system doesn’t offer a collection of ready made templates, but it makes it possible to create your own website design to come up to your needs. Advanced Form Builder. Adobe Muse Form Builder allows creating an extensive variety of fields, such as name, contacts, texts, checkboxes, buttons etc. Currently, there is no file upload option here, but you can customize your online form based on your needs and adjust the settings to redirect the messages users send to your email address. This is easy and convenient. Long Free Trial Period. Adobe Muse offers a 30-day free trial period to let your explore all the system features to the advantage. This term is longer than that in the majority of other website builders and allows getting used to all the features of the website building software. Offline Website Builder. Being an offline website builder software, the system can be used, even if there is no Internet connection. Just download and install it to start working on your website development. This doesn’t take much effort and time. Integrated Widgets. The platform provides an extensive choice of integrated free and paid third-party extensions (widgets). A user can individually configure and edit them when needed with no effort at all. Responsive Designs. The service allows creating responsive websites from scratch. It has recently released an update, which makes it possible to make any default Adobe Muse composition widget responsive prior to placing it on a page. All the content available in the Form, Slideshow and Composition widgets will automatically adjust to any screen sizes and resolutions. Cooperation with Reputable Template Providers. Adobe Muse doesn’t have its ready made template collection, but it allows building themes for personal and business use from scratch. At the same time, the website builder software effectively cooperates with reputable template providers (MuseFree, Muse-Themes, Musegain, MuseGrid etc.) to provide a broad array of template choice. Adobe Muse is undoubtedly a great help to people who don’t code. However, we think it has a very small potential user-base. With web design, you need graphic design skills, motion design skills and understanding of how to create interactions. In our opinion, professional graphic designers are more likely to team up with developers and other specialists to create complex projects. This leads us to conclude that Adobe Muse will be mainly used to create small static websites focused on visuals, rather than feature-rich sites, though Muse makes it possible to add a blog and eCommerce. Are they any better than Adobe’s product? It all depends on what you need. 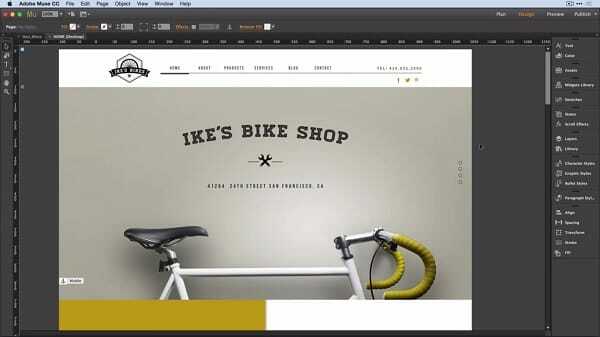 Adobe Muse allows designers to create and publish websites independently from developers. Perfect for simple, static websites with a focus on design. Meant for professional designers, Adobe Muse provides a wealth of graphic design features. It places a heavy emphasis on letting creative professionals do what they do best – design. But unfortunately, Adobe Muse lacks many built-in extensions that you can find in competing services. Designers can certainly find them among Muse Resources, but that makes the process less streamlined. The feature-heavy interface of Adobe Muse makes it ill-suited to the regular customer. If you just want to quickly build and publish a simple website, Adobe Muse isn’t the best solution. There are many less sophisticated, more streamlined drag-and-drop site builders for easy site creation.